Cardboard kayaking silliness in Fishguard, Pembrokeshire, Wales. On Saturday 20th September 2014 an amazing evening of cardboard kayak silliness was had in Lower Town Fishguard Harbour. With well over one hundred and fifty spectators along the quay wall, the atmosphere was electric. The crowd had a great time enjoying the laughter, hog roast and beer, provided by the excellent Cafe On the Quay while cheering on the fun-loving competitors who made their voyage out into the sea in homemade kayaks. 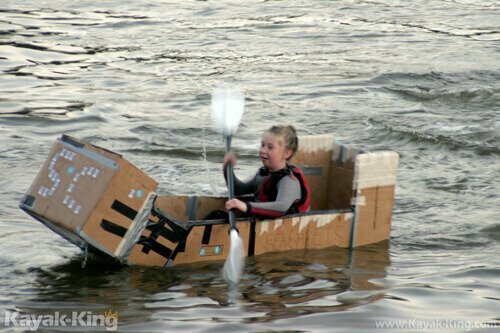 The Kayaks were made using only cardboard, duct tape, glue and dreams took to the water in an all-out battle for glory and awards! The Cardboard Kayak race in Lower Town Fishguard was a massive success will you enter next year?